The first [objection] is that federal intervention in education is unconstitutional. It is the fashion these days to say that responsibility for education “traditionally” rests with the local community—as a prelude to proposing an exception to the tradition in the form of federal aid. This “tradition,” let us remember, is also the law. It is sanctioned by the Constitution of the United States, for education is one of the powers reserved to the States by the Tenth Amendment. Therefore, any federal aid program, however desirable it might appear, must be regarded as illegal until such time as the Constitution is amended. The third objection to federal aid is that it promotes the idea that federal money is “free” money, and thus gives the people a distorted picture of the cost of education…. The fourth objection is that federal aid to education inevitably means federal control of education…. In our attempt to make education “fun,” we have neglected the academic disciplines that develop sound minds and are conducive to sound characters. Most important of all: in our anxiety to “improve” the world and insure “progress’ we have permitted schools to become laboratories for social and economic change according to the predilections of professional educators. We have forgotten that the proper function of the school is to transmit the cultural heritage of one generation to the next generation, and to so train the minds of the new generation as to make them capable of absorbing ancient learning and apply it to the problem of its own day. We should look upon our schools—not as a place to train the “whole character” of the child—a responsibility that properly belongs to his family and church—but to train his mind. 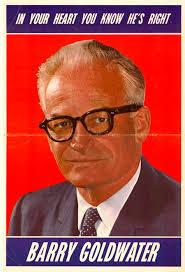 I am struck by Goldwater’s prophetic sense of where things were heading from his vantage point over fifty years ago and his warnings about the dangers of federal control of education and the efforts toward social manipulation to which it would lead. It is also striking to think that the Republicans had men in those days who could think in this way, who were philosophically and principally grounded, and who could articulate those thoughts cogently. They even put these sorts of men up for the highest office in the land (though Goldwater famously lost in a landslide in 1964). I think the most important immediate take away for Christians from this recent bathroom letter episode, aside from any practical political efforts that might be made by Christian citizens in opposition to it, will be renewed consideration of the ethics of Christian participation in public schools. As has been quipped, “If you send your children to Caesar, you should not be surprised when they come back as Romans!” There has, of course, already been a significant exodus of Christians to private Christian schools and to home-education. There will need to be more encouragement and assistance in this in the future, as well as the defense of our rights to do so, a battle which might be on the horizon. You make some good points here. I graduated high school in 1970, and as early as grade school I was able to see the public school system as a vehicle for indoctrination into society rather than an institution for learning. Deductive thought was discouraged unless it supported the school teacher's idea of a beneficial civic model. I deliberately supported this system on one occasion, then had to provide a definition for the word unscrupulous at the instructor's request. I'm sure she didn't know what it meant, along with several other words I used. I was, generally speaking, a failure at public school. Oddly (I suppose) I succeeded at college. Parents will eventually end up in a battle with the government over the right to educate their children at home. The government will point out that there are certain parents that have no business educating anyone, and the trouble is that the government is quite right about this. At the same time, Christian schools will come under fire due to their course material in science, mainly in biology (evolution anyone? ), and again, the government can pick and choose the battles with forethought and deliberation, and will likely win. When this happens I hope that the Christians involved in the controversy remember Romans 13. For my part, I cannot for the life of me understand why the Lord would ever allow Obama to be President, but I believe that even if He were to explain it to me in great detail, I wouldn't understand. So I'll soldier on, knowing that everything is going to turn out well. MJ, thanks for the comment. I've often heard it said by my contemporaries that schools have changed since we were there. Obviously, the culture is shifting swiftly. Interesting though that BG saw it coming and tried to warn against it. Christians, as always, have to balance Romans 13 and Acts 5:29. Funnily, I just read the same book yesterday as well. I only wish our current Republican frontrunner could write as clearly about conservative principles.